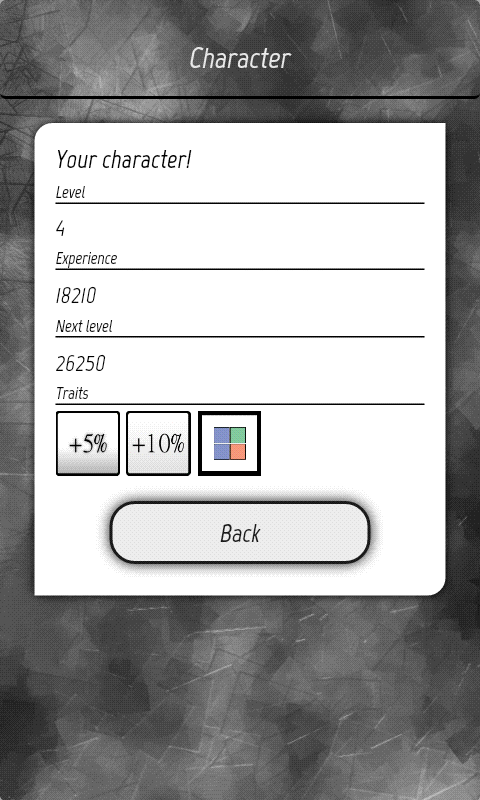 Read the complete review of a new Arcade based RPG Puzzle game in Google Play - Kludd. Know what this one man developed HTML5 game offers and if it has the qualities to be the next big thing or just another game that can go into oblivion. When Candy Crush Saga was launched it achieved an unexpected success. If we evaluate the reasons of that success now, we find that it offered the players a gameplay that was relaxed, easy to understand yet had enough difficulty to keep the game interesting even after playing it for long intervals. Today I played another game which I feel is somewhat similar to the color cube solving mechanism of Candy Crush but offers a new dynamic which is quite interesting to experience. The name of this game is Kludd, which is a south Swedish word meaning messy or not well done. This naming might be due to the fact that this being a one man project is not a fancy game with lots of animations or images and the developer might have thought this name suitable. However, that does not gives us any reason to downplay the quality of the gameplay or the game overall. Let me take you through what all I liked and not liked in this game. Kludd is a new game on Google Play from a one man team who goes by the brand name - Morkalork. This is a game completely designed in HTML5 and falls into arcade role playing puzzle category. 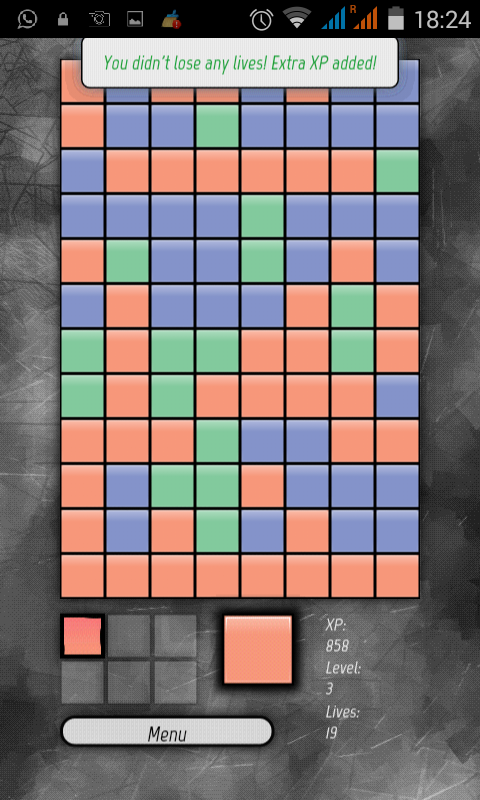 Rather than requiring you to rearrange the cubes to make combination, you have to remove the tiles of a particular color corresponding to the color of the Indicator at that particular move. You can only remove group of 3 or more tiles of the same color. The more tiles you remove in one move, more experience you gain. The experience you gain in the game is used to level up. With each progression of level you get bonus which can help you make the game easy or make it more easy to get more experience. You also get in-game bonus for removing lots of cubes in one move. These bonus are cubes that when activated remove all the cubes of the same color or a cube that will double your the experience on your next move. There are primarily 3 color codes cubes- red, blue and green. There is also a yellow colored cube which is a little different from the first 3 colored cubes. Your aim is to clear the screen from all the cubes. However, as you can do removal only in pair of 3 or more you have to carefully clear the cubes so that you do have pairs for the last cubes you remove. In case no combinations remain, the screen is cleared of each cube one by one with each cube deducting you life, called XP. It means that out of the total 20 XP you get in a game, in a single instance of a game you can lose much more than 1 of your XPs. The yellow cubes are not counted in this deduction. So suppose if you have 6 cubes remaining with 3 being blue, 2 yellow and 1 blue then only 4 XPs will be deducted. Once your life count comes to 0 and the cubes are still remaining on the screen, each cube costs you deduction of 25 points. At the end of the game, that is when you life count becomes 0 your total score is calculated. There is a centralized score board where you can see the top scores from other players. However, the scoreboard is something which needs the attention of the developer as it is really a "Kludd". If you take a look at the image you can easily see that out of the top 10 spots I am occupying a lot of them. Each time I played a game and if it was greater than any of the players earlier listed then my scorecard replaced the other player's scorecard. Ideally, my scorecard should show up there only once and the next time when I beat my old high score, the stats should be updated or I should be shifted upwards in the list with my updated scorecard. However, that clearly was not happening. I am hoping this would be corrected in the next update of the app. I found the game to be highly addictive just like many people are addicted to Candy Crush. I went on playing the game for whole 1 hour after installing it and I plan to continue it later. Unlike other freemium games this doesn't even irritate you with constant ads. Except on the launch of the app you would not find ads during your whole session of the game. Progress in Kludd game is quite difficult though. Even after giving a lot of mind in the game I was not able to cross my high score of 3257. I also did not feel the difficulty level to be progressing with the levels. Rather, it felt like the same difficulty level in all the levels I played. Here your luck and puzzle solving skills both are important to progress higher in the game. Not many people have downloaded this game but that is simply due to the fact that this does not come from a house of big developers so not much marketing has been done for this. However, I highly recommend you to give this game a try and who knows it just might reach the popularity of Flappy Bird. Pros: Simply yet highly challenging gameplay. Not much ads in spite of being based on freemium model. Can give a nice competitive feel if you play with friends. Cons: Difficulty feels constant through different levels. Scorecard of the top players can overcrowd the top 10 scorecard.